The Memorial Candle Program has been designed to help offset the costs associated with the hosting this Tribute Website in perpetuity. Through the lighting of a memorial candle, your thoughtful gesture will be recorded in the Book of Memories and the proceeds will go directly towards helping ensure that the family and friends of Shirley Johnson can continue to memorialize, re-visit, interact with each other and enhance this tribute for future generations. Johnson, Shirley K. (nee Kabele), on Tuesday, July 17, 2018. Beloved wife of George M. Johnson for 61 years; dear mother of Susanna (Theodore) Kettlewell, George IV (Barbara) Johnson, William (Lynn) Johnson, and Peter (Jennifer) Johnson; loving grandmother of Jenny, and Mary Kettlewell, Becca (Kevin) Van Gels, Victoria, George V, and Andrew Johnson, Rita (Rusty) Waynick, Christopher (Lisa) Straub, Matthew (Francesca) Straub, Chase, Connor, and Hailee Johnson, Jade Wiley, Grace (Brady) Pierce, Peter Jr., Julia, Anna, Daniel, Lily, and Ruth Johnson; loving great-grandmother of Caroline and Isabelle Van Gels, Caleb Waynick, and Penelope and Sebastian Straub. Born May 22, 1932 in St. Louis, MO, Shirley Ann Kabele was the only child of William Francis and Marie Josephine Kable. 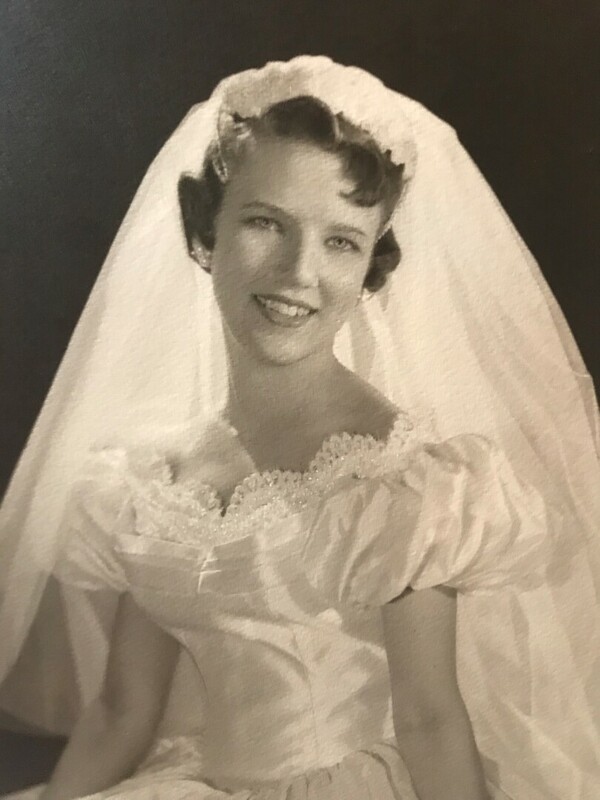 Valedictorian of the Cleveland High School class of 1950, Shirley went on to attend Washington University in St. Louis earning her Bachelor Degree with Honors in English in 1954. Shirley and George met in 1956 and were married May 11, 1957. George was always proud of the fact the Shirley was a “Big Wheel on Campus”, Sophomore Queen, and editor of the school newspaper. Shirley was fun, and fun-loving, always ready with a smile. She loved music and dancing, and played the piano beautifully while she was still able to do so. She played guitar and sang with her family. She instilled this love of music in her children, who all took piano lessons for years, before branching out into sax, drums, guitar, and voice. Shirley was a busy mom, raising four kids with all of their activities, but still made time to be a Girl Scout leader, a Cub Scout leader, and one of the leaders of the Junior High Youth at church. For a while, she served as secretary for George’s business. She was a member of Delta Gamma sorority, and volunteered at their annual Christmas Tree Lot fundraiser. In later years, she was involved with the Glendale Women’s Club, and served as their president. Shirley was a wonderful, loving mom, taking the shenanigans of four active and rambunctious kids, and the family menagerie, in her stride. She loved cooking and feeding those she loved, and had quite a reputation for being a great cook. As her illness progressed, Shirley retained her fighting spirit. She continued her activities as much as she was able, never giving in, never complaining, but continuing to fight and stay active, caring for her husband and family. She was the bravest woman we have ever known. She was a homemaker in the truest sense, she and George created an atmosphere of warmth, laughter, support, and love. In a word… home. Funeral service Sat., July 21, 10:00 a.m. at Central Presbyterian Church, 7700 Davis Dr., Clayton, MO. Interment following at Dardenne Presbyterian Church, 7400 S. Outer Rd. 364, Dardenne Prairie, MO. Visitation Fri. 4-8 p.m. at Bopp Chapel, 10610 Manchester Rd., Kirkwood.